Our office believes that white composite bonded fillings are a superior material to mercury silver fillings, and we have been mercury free since 2005. White composite fillings are a mixture of glass or quartz filler in a resin medium that produces a tooth-colored filling that is chemically bonded to the tooth. Composite fillings provide good durability, are resistant to fracture, and allow for less tooth structure removal when the tooth is prepared. 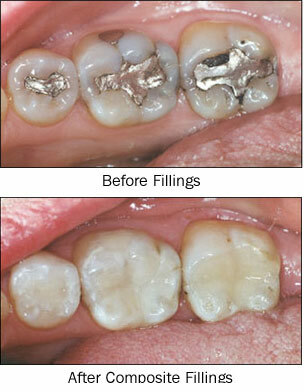 This usually results in a smaller filling than that of the traditional mercury amalgam fillings. Excellent aesthetic results are achieved with composite fillings, which often are completely invisible. Composite fillings are used to fill cavities, replace old fillings, restore broken cusps of teeth, and to replace worn enamel.